Marcus(R) Hotels & Resorts Purchases Interest in and Assumes Management of The Hotel Zamora in St. Pete Beach, Fla.
Marcus(R) Hotels & Resorts, a division of The Marcus Corporation (NYSE:MCS) , today announced it has entered into an agreement to assume management of The Hotel Zamora and Castile Restaurant in St. Pete Beach, Fla., effective November 1, 2014. The company has also acquired a 10% minority interest in the hotel and restaurant, which is owned by Zamora Hospitality Group, LLC of Tampa, Fla. 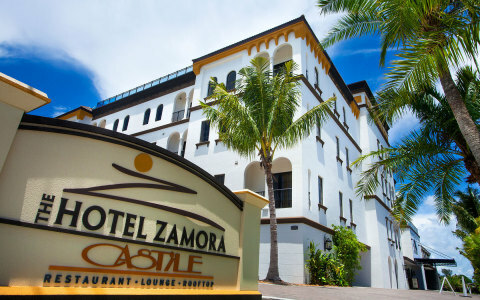 The Hotel Zamora is the first new hotel to open in St. Pete Beach in more than 20 years. Influenced by the architecture, design and cuisine of the Zamora region in Spain, the hotel offers 72 luxurious guest rooms incorporating 22 two-bedroom suites and 9,000 square feet of meeting space, including one of the most scenic rooftops in Florida. Opened in June 2014, the stunning boutique luxury property overlooks the Intracoastal Waterway and the Gulf of Mexico in the heart of one of TripAdvisor’s “Top Ten Beach Destinations in the United States.” Its striking white-washed Romanesque facade with curved windows and balconies sets the stage for a fashionable environment that includes the stylish Castile Restaurant under the direction of acclaimed chef Ted Dorsey, serving contemporary cuisine influenced by the culinary traditions of Spain, Mexico and the Mediterranean, and an elegant and spacious rooftop bar with beautiful ocean views. “We are thrilled to assume management of The Hotel Zamora and to bring our more than 50 years of lodging expertise to this truly outstanding property. We look forward to helping The Hotel Zamora build a reputation as an exceptional waterfront destination hotel known for its excellent hospitality and attentive service,” said Thomas F. Kissinger, interim president, Marcus Hotels & Resorts and senior executive vice president of The Marcus Corporation. Recently named one of nine great new U.S. beach hotels by CNN, The Hotel Zamora offers fine leather furnishings, arch-framed balconies, Intracoastal docks and a bay-front swimming pool that cater to savvy and stylish Florida travelers seeking a luxury experience. Guest rooms feature walk-in spa showers, soaking bathtubs and plush Terry bathrobes, creating a spa-like retreat. For more information, please visit: www.thehotelzamora.com. For additional photos of The Hotel Zamora and more information on the latest news and updates from Marcus Hotels & Resorts, please visit http://media.marcushotels.com. As the first new hotel to grace St. Pete Beach in 20 years, The Hotel Zamora offers contemporary luxury, delectable cuisine and vibrant amenities influenced by the Zamora region in Spain. Castile, the hotel’s destination restaurant and rooftop lounge, offers a seafood-driven menu that includes an eclectic selection of tapas, starters and creative entrees. Amenities include high-tech meeting space, a marina with space for seven boats, fresh-water pool, fitness center and access to the Gulf of Mexico’s immaculate white-sand beach. For more information, please visit www.thehotelzamora.com. Based in Tampa, Fla. and established in 2013, Zamora Hospitality Group is an upscale boutique hotel investment and development company that prides itself in being able to identify and locate unique properties while developing iconic memorable hotel and restaurant concepts. Zamora Hospitality Group’s principals have a diverse background from Wall Street, finance, medicine and health & wellness, and all co-invest in the concept developments and financial support of the projects. Marcus Hotels & Resorts is a division of The Marcus Corporation (NYSE:MCS) . With the addition of The Hotel Zamora, the company owns and/or manages 20 hotels, resorts and other properties in 11 states. A force in the hospitality industry, Marcus Hotels & Resorts provides expertise in management, development and historic renovations. The company’s portfolio includes a wide variety of properties including city-center meeting hotels, upscale resorts and branded first-class hotels. For more information on the latest news and updates, please visit: http://media.marcushotels.com and follow the company on Facebook and Twitter (@MarcusHotels). Headquartered in Milwaukee, Wis., The Marcus Corporation is a leader in the lodging and entertainment industries, with significant company-owned real estate assets. In addition to its Marcus Hotels & Resorts division, the company’s movie theatre division, Marcus Theatres(R), is the fifth largest theatre circuit in the United States and currently owns or operates 685 screens at 55 locations in Wisconsin, Illinois, Iowa, Minnesota, Nebraska, North Dakota and Ohio. For more information, visit the company’s web site at www.marcuscorp.com. Certain matters discussed in this press release are “forward-looking statements” intended to qualify for the safe harbors from liability established by the Private Securities Litigation Reform Act of 1995. These forward-looking statements may generally be identified as such because the context of such statements include words such as we “believe,” “anticipate,” “expect” or words of similar import. Similarly, statements that describe our future plans, objectives or goals are also forward-looking statements. Such forward-looking statements are subject to certain risks and uncertainties which may cause results to differ materially from those expected, including, but not limited to, the following: (1) the availability, in terms of both quantity and audience appeal, of motion pictures for our theatre division, as well as other industry dynamics such as the maintenance of a suitable window between the date such motion pictures are released in theatres and the date they are released to other distribution channels; (2) the effects of adverse economic conditions in our markets, particularly with respect to our hotels and resorts division; (3) the effects on our occupancy and room rates of the relative industry supply of available rooms at comparable lodging facilities in our markets; (4) the effects of competitive conditions in our markets; (5) our ability to achieve expected benefits and performance from our strategic initiatives and acquisitions; (6) the effects of increasing depreciation expenses, reduced operating profits during major property renovations, impairment losses, and preopening and start-up costs due to the capital intensive nature of our businesses; (7) the effects of adverse weather conditions, particularly during the winter in the Midwest and in our other markets; (8) our ability to identify properties to acquire, develop and/or manage and the continuing availability of funds for such development; and (9) the adverse impact on business and consumer spending on travel, leisure and entertainment resulting from terrorist attacks in the United States or incidents such as the tragedy in a movie theatre in Colorado in July 2012. Shareholders, potential investors and other readers are urged to consider these factors carefully in evaluating the forward-looking statements and are cautioned not to place undue reliance on such forward-looking statements. The forward-looking statements made herein are made only as of the date of this press release and we undertake no obligation to publicly update such forward-looking statements to reflect subsequent events or circumstances.